The snow was half a metre thick in Guildford when I returned from Spain last week. That’s the most snow we’ve had in England for twenty years or more, and easily the thickest fall I can remember anywhere outside the Alps. Cold weather saw the white stuff last into the weekend, and it seemed the perfect time for a blast across the hills. Here’s a short film I took on Saturday, soon after sunset. My favourite time of day for running, and there’s nothing quite like running in the snow. As I write, our snowman is now shrinking sadly in the rain. But we’ll remember last week for a much longer time to come. 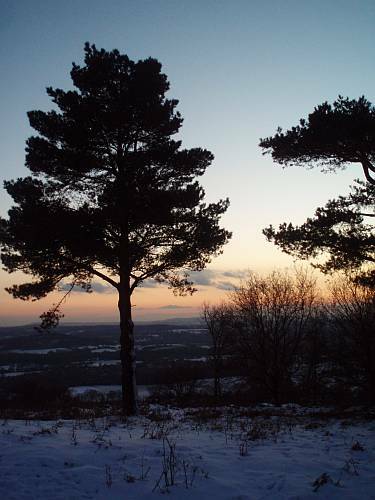 This entry was posted in 2009, Guildford, Surrey and Sussex, winter. Bookmark the permalink. Thanks for the video of St. Martha’s, Roads. I love that place and every time I go there I think that is where I would like my ashes scattered (many years from now!) – it is just so lovely and quiet and the views are spectacular. Feel quite homesick! Many thanks, Louise. St Martha’s is a very special place, I agree. It’s a demanding run to get to the top, but always worth the trip. Recently, the trees below the summit have been thinned dramatically, making the church much more visible from Chilworth and the Tillingbourne Valley. You can now see the church very clearly lit up by the low sun from my commuter train heading east from Guildford towards Dorking. On a bright winter’s morning, it’s the perfect view to start the day. 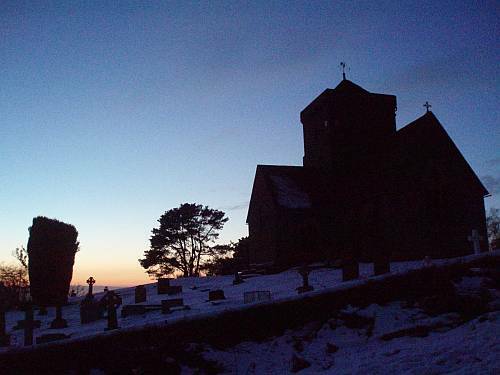 It´s great to be able to watch the beautiful snowy scenery and St. Martha´s church with your interesting commentary. Gracias, R.
Thanks, Antonio. This place reminds me of one of my favourite Spanish haunts – the Ermita Señora de Brezales, near Espejón, Soria. Greetings, Shady, and welcome to roads of stone. You’re very welcome here. I live on the north slope of the Downs, and we had a much thicker fall here than many other places not that far away. The snow melted quickly towards the south coast, and only really began to get thick just a few miles to the south of town. The depth of snow here was quite remarkable. Roads around here were closed to traffic all week. 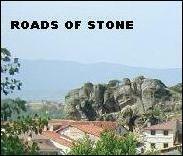 Roads of Stone videos now! Way cool. It’s absolutely beautiful there. I couldn’t help but wonder if the following day was good weather, for I noticed the sky and thought of the old rhyme, “Red sky at night, sailor’s delight. Red sky in morning, sailor take warning.” It’s right far more often than it’s wrong in my corner of the world. Thanks for a super video. Thanks, Ella. I love this spot, and I’m very lucky to have it within running distance from home. Danny Boyle is one of my favorite people in film. When he was in NY promoting Shallow Grave, which I loved, I met and had a long chat with him. He was utterly delightful. Unassuming, boundless energy, both fun and funny. I don’t think he’s changed a bit. I am thrilled about his success. You can use a beer bottle as a pretend microphone for your acceptance speech! Yes, Ella — how fantastic it is that Slumdog Millionaire has been so successful, and how lucky you are to have had the chance to meet its director, Danny Boyle. Amongst his other films, Sunshine was spectacular, but I especially enjoyed Millions, too — an engaging tale of a pair of boys who grow unexpectedly and problematically rich when they pick up a huge stolen cash haul, thrown by bank robbers in panic from a train. As for Slumdog, it’s amazing now to think that it very nearly didn’t make it into the cinema at all — the whole production team spent three miserable weeks last year convinced that the film wouldn’t be released in the US, and that it would go straight to video. The film poster here in the UK marketed Slumdog as ‘the ultimate feelgood movie’ but in many respects it covers far from comfortable material. Some critics here have seen the film as a timely love letter to Mumbai, now changed by the terrorist attacks there. For me, the film isn’t about any of those things. There is a rare energy, a passion and a belief in Danny Boyle’s film-making, and a vibrancy of sound and colour to enjoy. But above all I see the message that the world is changing, and that there is an emerging world out there which extends far beyond the narrow conventional boundaries of Hollywood fiction. There are a billion people living in India — far more than in North America and Europe combined. In economics, we are seeing the start of a shift of strength and emphasis to the east. It’s inevitable that we will see the same in entertainment, too, and in exploring the human condition we will gradually come to appreciate the stories of those who live beyond our narrow horizons of Manhattan, Manchester and Madrid. The sheer frenzied marvel of Boyle’s cinematography has been to tell the story of Mumbai to millions of people who will never go there — folk who in their daily lives would otherwise barely consider that India even exists, or that the lives lived out there are worthy of our attention. As they most certainly are.